Tapioca or cassava is a tropical root and I believed most Singaporean and Malaysians are very familiar with this root. In fact, I grew up with this familiar childhood root. When I was young, my parents planted some tapioca at the sides of our house. When she felt like preparing tapioca cake, she would asked my elder brothers dug out the roots, de-skinned and used a traditional grater to grate the tapioca….As grating tapioca was rather tedious and in the 1970’s when there were stores selling grated coconut for the preparation of coconut milk., she brought the de-skinned tapioca all the way to the grated coconut seller and asked for his favour to grate for her….Not many years later, coconut milk seller also started to sell grated tapioca as a side item….. 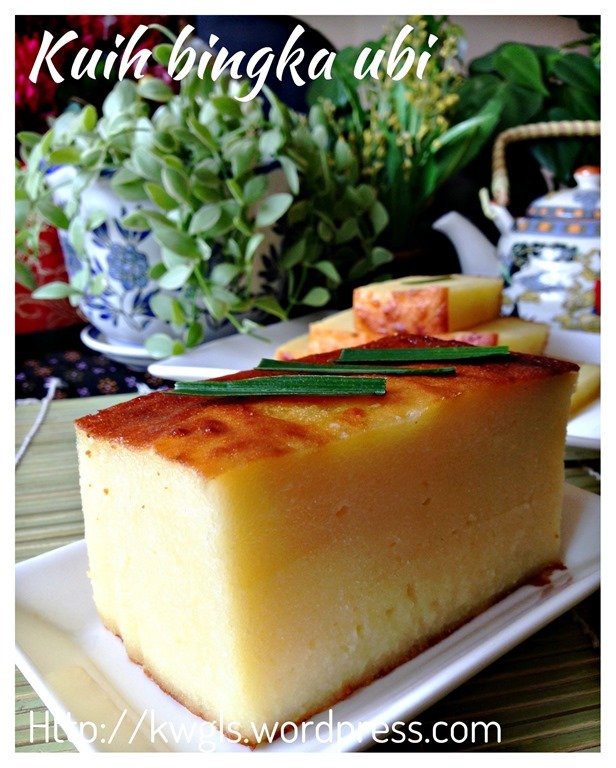 Therefore, tapioca cake is not something new to me.. I saw my late mum prepared this all the time. Just like most other traditional recipes, there were no formal record of the quantities used..However, I can remember clearly the consistency of the batter before the batter was steamed. The baked version was not common until the availability of household ovens many years later. However, there were still those who baked the cake using charcoal ovens. 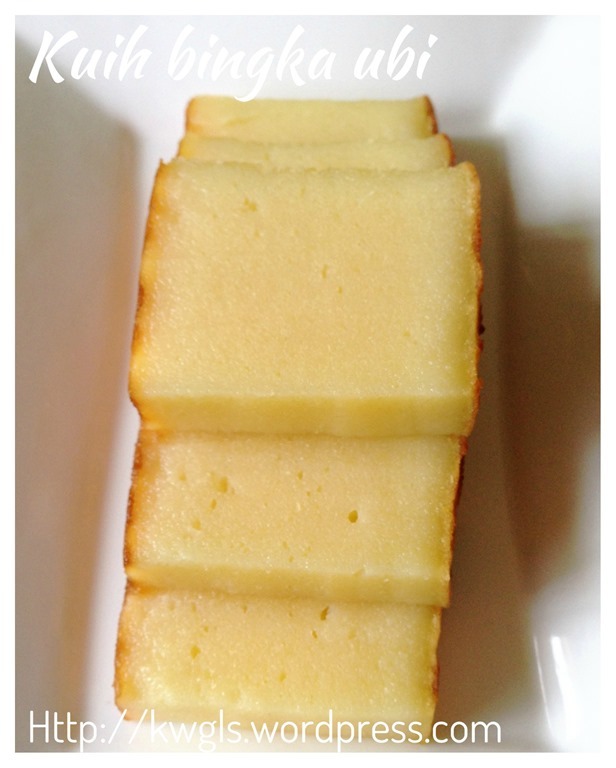 In my humble opinion, this is a rather simple cake to prepare. You just need to mix and bake. However, it takes a rather long time to bake the cake depending on the size of your baking tin and some observation is needed to assess whether it is done. 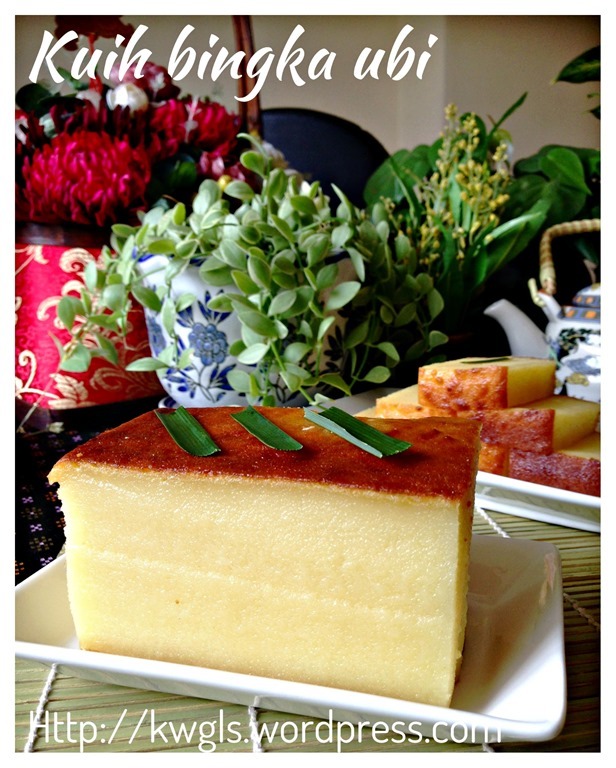 Many Facebook Group members were surprised to see that the tapioca cake is smooth.. 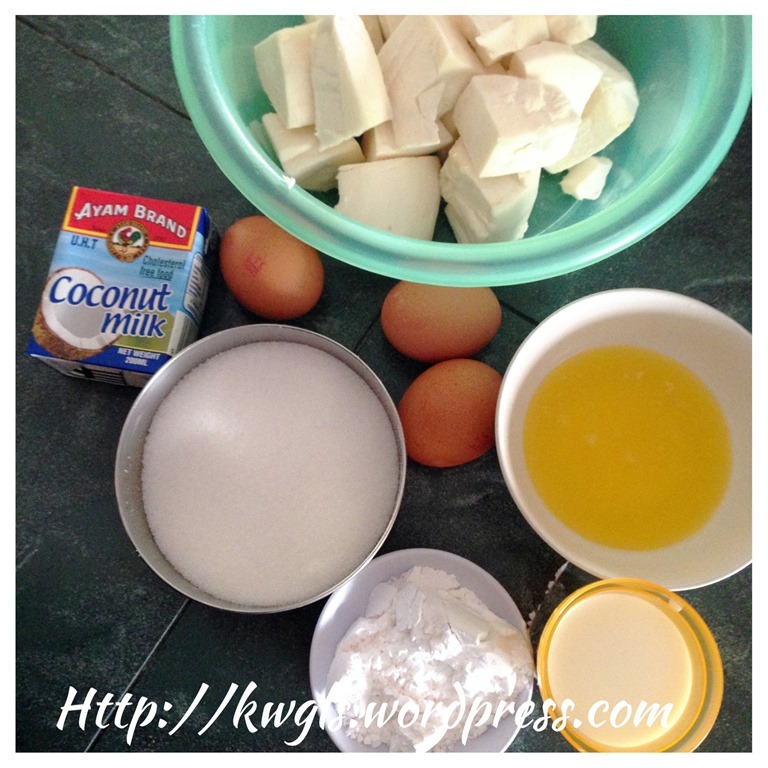 Yes it is smooth and fine because I used a blender to blend it finer and ensure even mixing. If you manually grate or using store bought grated tapioca, the texture will be slightly coarser and there are possible signs of uneven mixing. Not to discourage readers who do not have the blender and food processor, taste of course will still be the same. The texture of this cake is definitely not hard and as you can see later the watery batter in the illustration picture. That is the type of consistency that I remembered when I saw my late mum prepared it. 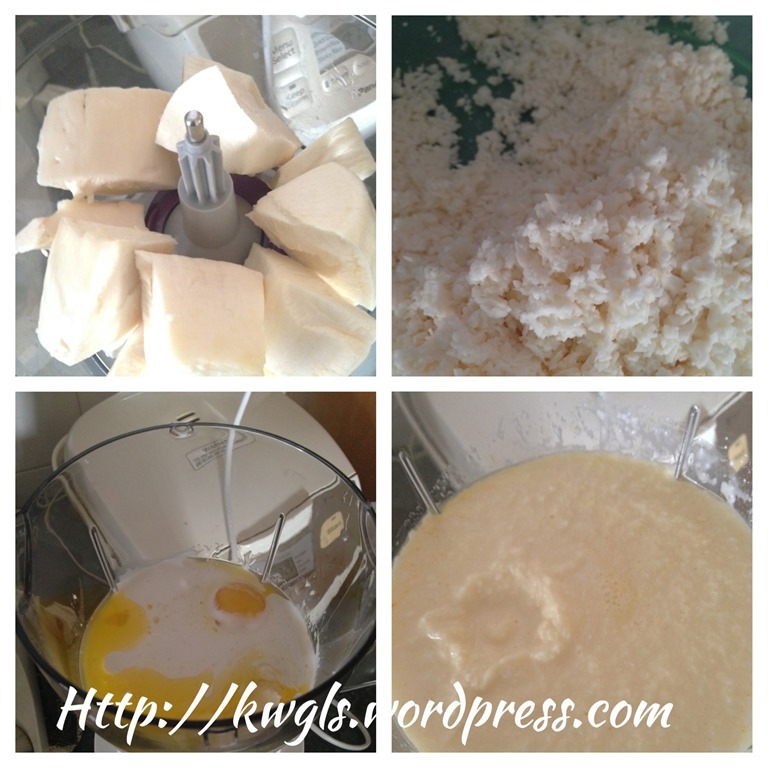 Unlike other recipes, I did not let the grated cassava drip until dry or squeeze out all the juices before baking. In my humble opinion, this is not necessary and I have never prepared any tapioca that is bitter. 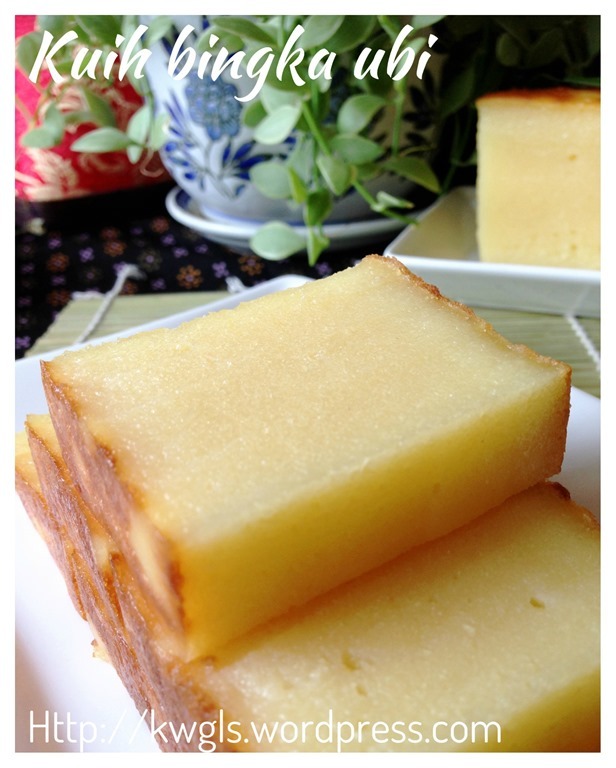 As for the colour of the cake, if you are using yellow coloured tapioca, the colour will be naturally yellow. For white coloured tapioca as in this illustration, the baked cake can be rather pale and some recipe call for the use of yellow colouring. However, I have added custard powder for colouring, flavouring and enhancing the binding of the cake. Note that in this illustration, I have used a 6’ square baking tin, though it is tall but it need at least 20 minutes extra to bake the entire cake. Line a 7’’ baking tray with baking paper or grease the tray well with cooking oil. Cut the tapioca in small chunks. In a food processor, blend the tapioca until as fine as you can. Transfer the blended tapioca to a blender, add all the other ingredients (eggs, custard powder, sugar, coconut milk, milk, melted butter, vanilla essence) and blend until as fine as possible. Transfer the batter to the lined or greased baking tin. 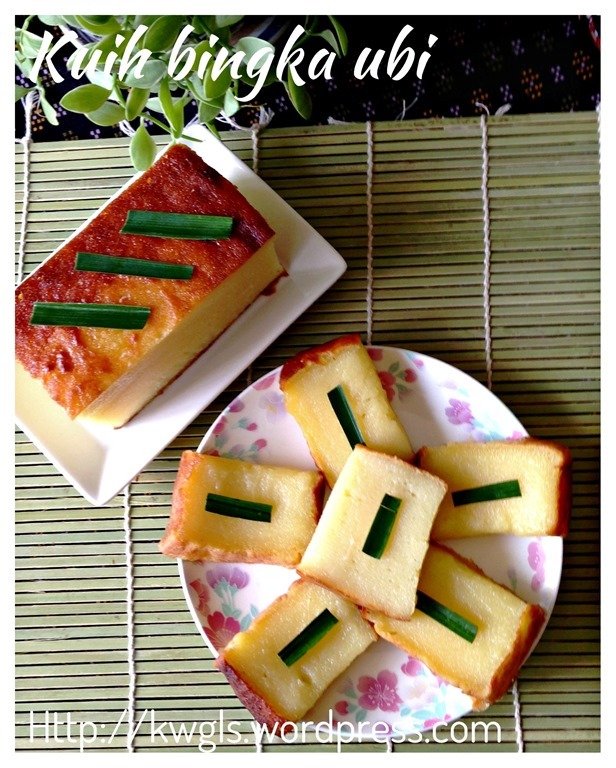 Baked in the pre-heated oven of 180 degree Celsius for 45minutes to 1 hour or until a skewer inserted into the centre of cake comes out clean. Note that the centre of the cake is rather difficult to bake, you have to insert the skewer a few times and at a few places. The timing of baking will depend on individual oven and the size of your baking tray. 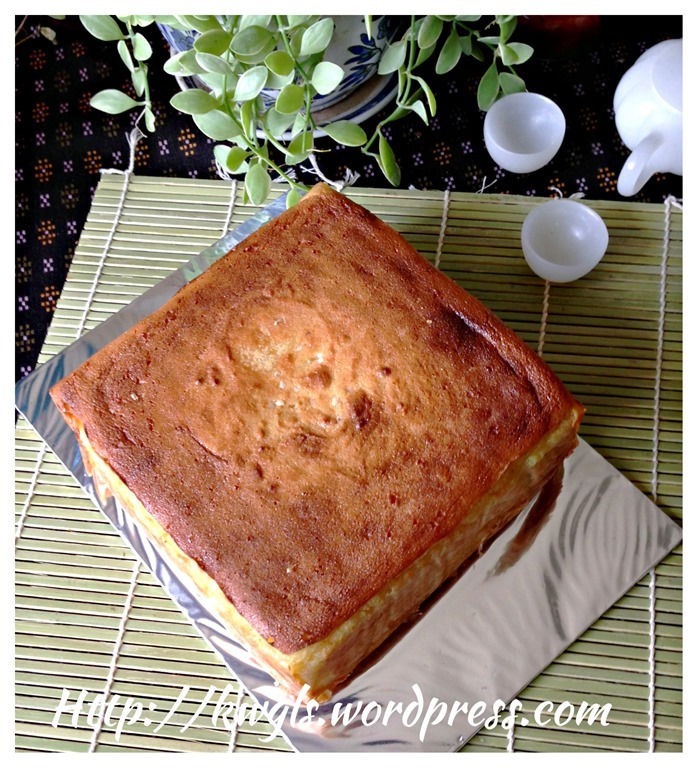 The bigger the size of the baking tin, the thinner the cake, the faster is the baking time. COOL COMPLETELY before slicing. It will take about at least 3-4 hours before you can slice the cake nicely with a greased sharp knife. It is best to let it rest overnight before slicing. 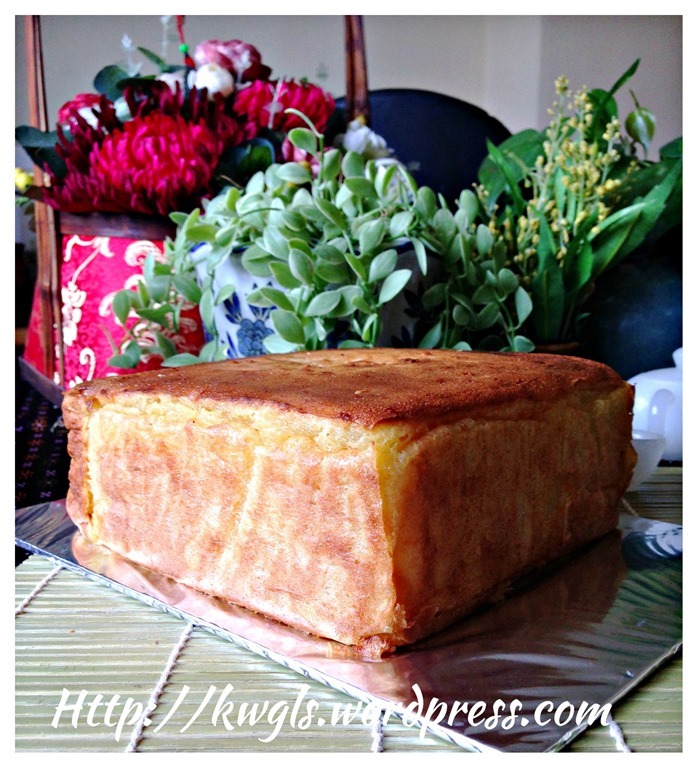 After slicing, if you cannot finish eating the cake within the day, store in the refrigerator and re-bake the cake at 100 degree Celsius until the cake is warm before serving. 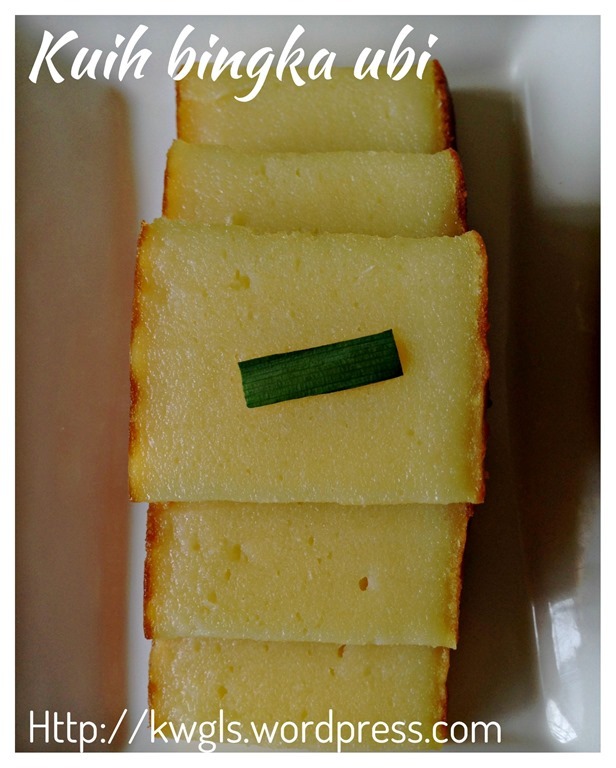 If you are satisfied with the texture of this cake, in your next attempt, feel free to explore more by adding a bit more coconut milk, cheese, eggs etc.. or possibly you would like a cheesy cassava cake. 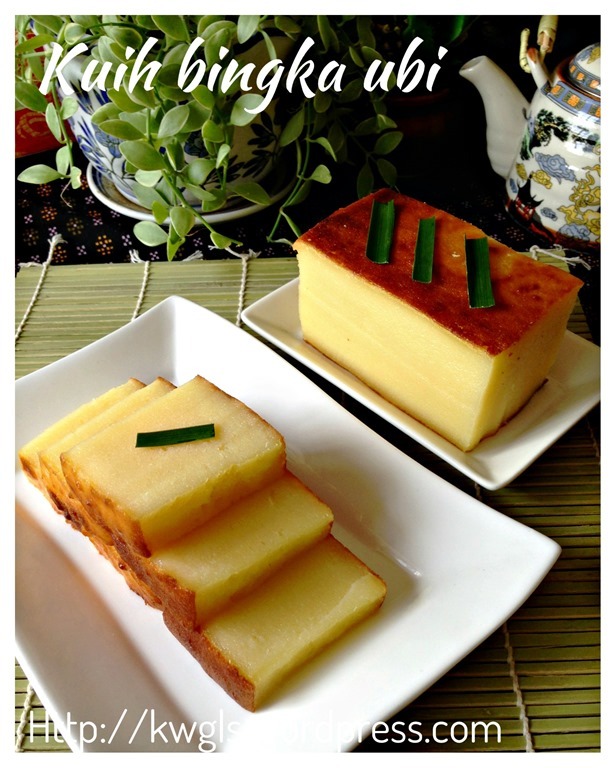 This entry was posted in Chinese and Asian Cakes and Snacks, Food Preparation Series and tagged 8, Baked Tapioca Cake, Bingka Ubi, Cassava Cake, 烤木薯糕, GUAI SHU SHU, Guaishushu, kenneth goh, Kue Singkong, Kuih Bingka Ubi Kayu, postaday. Bookmark the permalink. Hi Kenneth, try my recipe that I have improved it. 2 kg blended tapioca — squeeze out some of the juice. 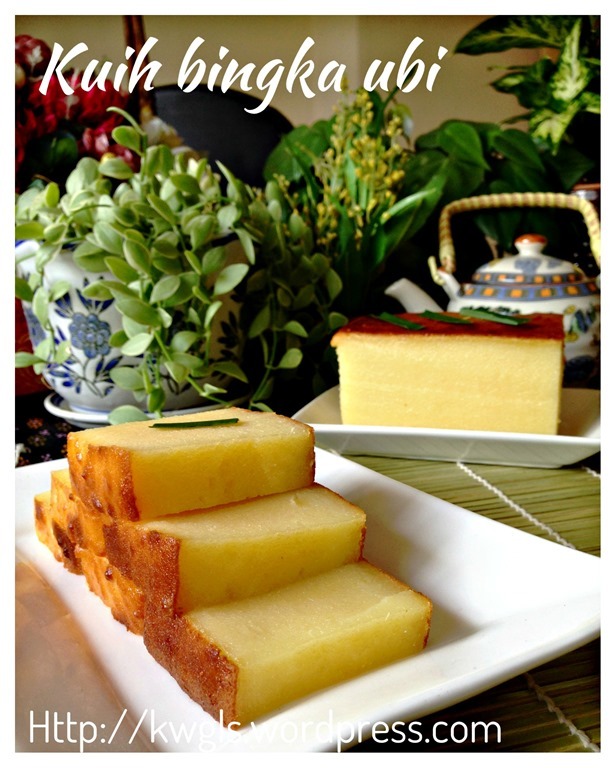 6 cup water, 1 cup thick santan, 200gm sugar, 300 gm brown sugar, some duan pandan. 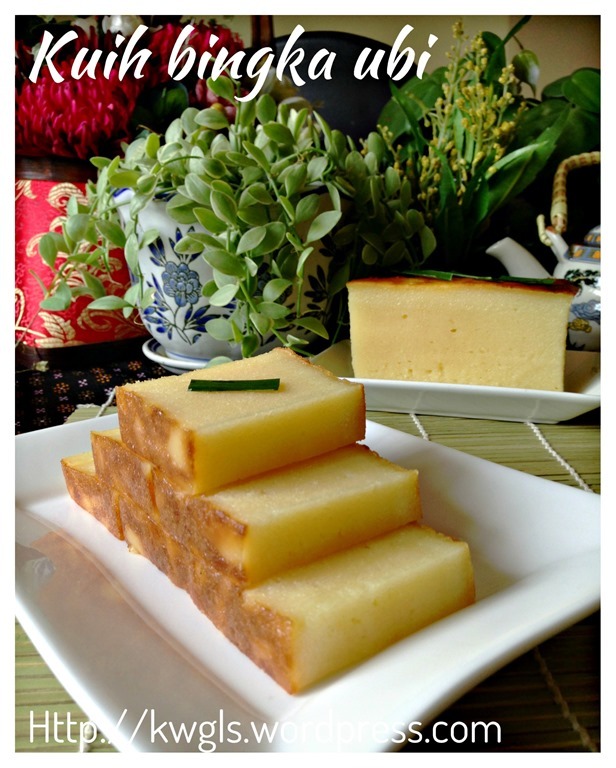 A –Mix 1 ¼ c rice flour, ¼ c Tang Mee flour, tapioca flour mix with 1 c water, 3 teaspoon salt – mix well. 1. Boil water with sugar, brown sugar, duan pandan, salt then sift it as sometimes the brown sugar has sand it in !! 2. Pour all the brown sugar mixture, santan, grated tapioca in a wok and ” A ” stir well until thicken. 3. 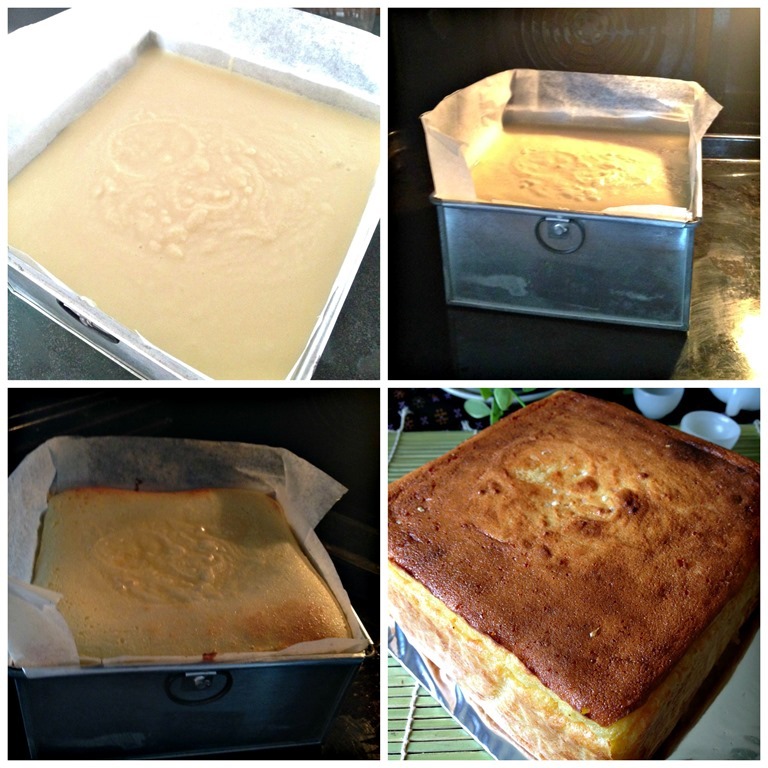 Pour into a well greased 10” X 12” greased with oil cake-tin and level it by using a piece of banana leaf/ back of a spoon with oil coated. 4. Bake until cooked & golden in color. If the bottom is not golden in color, grill it until golden after you have removed it from the tin. If I’m lazy, place it at the base of the oven as that metal is very hot. 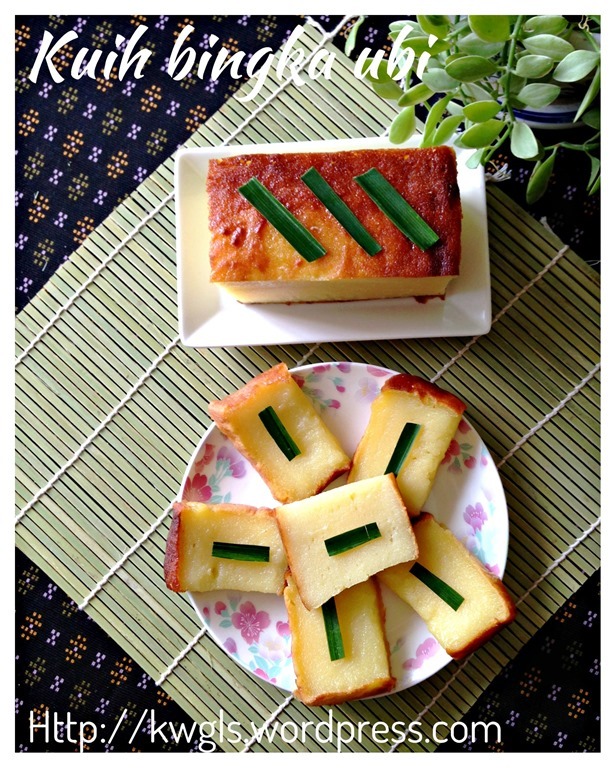 The A is the batter that I learn from Taiwan cooking website and it will make the Kuih very smooth and QQ. I used that for making Yam Kuih !! The Chinese brown sugar is for the colour and it is better than white sugar. Tapioca has a poison in it as many students had Food poisoning in school after eat the Kuih. A Dr. said that we must soak the tapioca after peeling the skin just like we soak our sweet potato or potato to avoid it to trun brown. I often did it as I afraid it will become brownish. So, I never have this problem. One of my Fillipino maids said that she stopped eat it as 1/2 of the Kampong folks died of Food Poisoning. They were so poor, they eat tapioca instead of rice !! Defin itely love this kind of dessert!!! 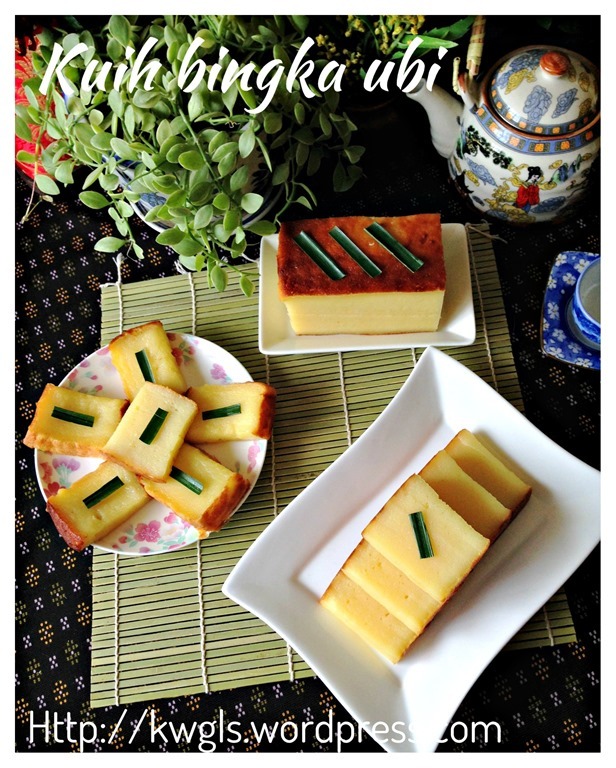 my grandma used to made it, even with sweet potato and pumpkin too….. I prefer a coarser texture; sort of gives the cake more “bite”. I also use brown sugar in my version. Thanks for the recipe though; good to compare and try other recipes as well. 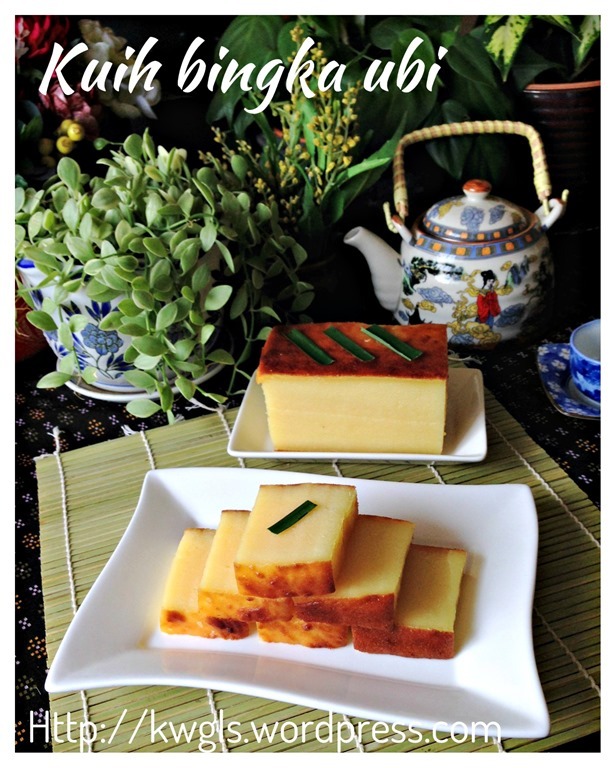 Recipe is a reference and feel free to tailor to suit your taste buds.